Devon is a stunning county with two beautiful coastlines, two National Parks and five official Areas of Outstanding Natural Beauty. Devon also known as Devonshire which was formally its common and official name is a county in South West England. The county reaching from the Bristol Channel in the north to the English Channel in the south is boarded by Cornwall to the west, Somerset to the north east and Dorset to the east. As well as agriculture much of Devon’s economy is linked to tourism with many visitors being attracted to the Dartmoor and Exmoor National Parks, its coasts including the resort towns along the south coast known collectively as the English Riviera, the Jurassic Coast a World Heritage Site, and North Devon’s UNESCO Biosphere Reserve and the countryside including the Cornwall and West Devon Mining Landscape. The main cities of Devon are Plymouth a historic port, Exeter the county town and Torbay the county’s Tourist Centre. Devon with its mild climate, coastline and landscape makes it a fantastic destination for recreation and leisure. There is so much to do in Devon from family attractions, historic buildings, award winning places to eat, thrilling outdoor activities, to exciting events happening all year round. Devon’s sandy family-friendly beaches with tiny pebbled coves, wild and windswept bays with stunning views can’t be beaten. There is also plenty of glorious green countryside, rolling hills, farmland and craggy moorland for walking, cycling and horse riding. Devon also has some wonderful historic cities such as Exeter and Plymouth with great shopping and bustling nightlife as well as friendly towns and pretty villages like Sidmouth. Then there are the large adventure parks and farm attractions to traditional seaside attractions such as surfing, kayaking, paddle boarding, sailing and fishing. No wonder Devon attracts so many walkers, cyclists, artists, camping enthusiasts, thrill seekers and also those that just wish to relax and gaze. And of course there’s a huge choice of places to stay whether looking for a relaxing long weekend, a fun-packed fortnight or budget break there’s luxury hotels, guesthouses, caravan sites, camping, glamping or self-catering cottages. Newton Poppleford is a large village in East Devon. It is situated on the A3052 road between Exeter and Sidmouth on the west side of the River Otter and consists of some whitewashed cob thatched cottages, post office which is also a newsagents and general store, butcher, village hall, primary school, sports pavilion and St Luke’s Church which was founded in 1331. The village and its surroundings are known for market gardening because of the excellent soil quality in the area. A variety of daffodil, the King Alfred, was originated in the village and received an award from the Royal Horticultural Society in 1899. It was first cultivated in one of the oldest houses in the centre of the village dating back to the 15th century with cob walls and thatched roof with a quaint brook passing through the garden joining the River Otter. The old Roman road from Axmouth to Exeter used to go through the village with Toll Houses at each end, but only one of these remain today. Colaton Raleigh is a small village situated on the B3178. It lies south of Newton Poppleford on the west side of the River Otter and houses a pub the Otter Inn, a shop named Woods Village Stores and a church dedicated to St John the Baptist. Otterton is a village which lies on the east bank of the River Otter south of Newton Poppleford and Colaton Raleigh and north of Budleigh Salterton. Otterton was firstly a Saxon settlement and because of its location and rich resources became the centre of one of the major rural communities in Devon by 1000 AD. The cob and thatches cottages are a fine example of buildings from the 16th century onwards. Otterton Water Mill is set beside the River Otter at the village of Otterton. The mill possessed three pairs of stones. The manor and its mill were given by King Henry V to the nuns of Syon Abbey. At the Dissolution the manor was sold to Richard Duke and it remained in the Duke family for 200 years. Denys Rolle bought it in 1785 and the estate and mill passed through marriage to the Clinton family who still own the mill as part of the Clinton Devon Estates. Milling ceased in 1959 and the buildings were used for grain storage. In 1977 the watermill was restored, by Desna Greenhow, and still works today. Next to the mill is a bakery, a shop, a restaurant and a gallery of arts and crafts. The mill hosts a yearly event with a Portable Antiquities team to examine archaeological finds made in the area. The River Otter rises in the Blackdown Hills just inside the county of Somerset north of Otterford then flows south for 20 miles through East Devon passing through or by Upottery, Rawridge, Monkton, Honiton, Alfington, Ottery St Mary, Tipton St John, Newton Poppleford, Otterton to the coast to the east of Budleigh Salterton after flowing through the 57 acre Otter Estuary Nature Reserve. The reserve is a Site of Special Scientific Interest consisting of tidal mudflats and saltmarsh and the coast is part of the Jurassic Coast, a World Heritage Site. 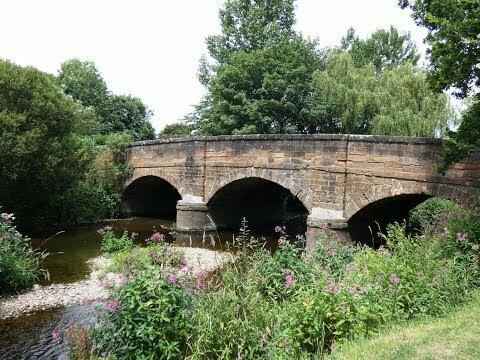 For much of it length the river Otter flows through two Areas of Outstanding Natural Beauty, The Blackdown Hills and East Devon. The river once powered as many as fifty watermills and one of the remaining working mills, thought to date from the 17th century, is Tracey Mill near Honiton. Fish ponds fed by the leat were dug around the mill in the 1970’s and over a million gallons of fresh water flow through these ponds every day, helping the commercial production of trout without the need for antibiotics or added oxygen. The River Otter is the only river in England known to contain a breeding population of beavers that died out in Britain around 1550. The beavers were first noticed in 2013 and in the following year they had bread three kits. Concern arose from local landowners, anglers and farmers that the beavers could carry disease so the government said that it would capture them and place them in a zoo or wildlife park but this was protested by local residents and campaign groups as most anglers have a great connection with nature and the chance of seeing wild animals while quietly fishing on the river bank is a major part of why they fish. The introduction of beavers to rivers has been encouraged by environmentalists who say that beaver dams provide habitat for birds and fish, reduce flooding by trapping water high up in a catchment area away from buildings and homes further downstream and could be a future tourist attraction. On the 28th January 2015 Natural England declared that the beavers would be allowed to remain on the condition they were free from disease and of Eurasian descent. The conditions were passed and the beavers were returned to the river as part of a five year trial scheme. From Otter Reach with the main road behind us we head forward to the bend then turn right through the kissing gate. We head forward for a short way then turn left at the footpath sign and keep heading forward between the fence and wall to go through a gate. We continue to head forward with the River Otter on our left until we reach a tarmac track. We turn left and after a short way we come to the river we now turn right. We keep to the riverside to go through a gate, cross straight over a concrete track and go through the gate opposite into the field. We bear left and head forward with the hedge on our left. We walk along a narrow path with hedges on either side. At the gate we head forwards then at the track we keep left and continue until we come to a small road. We turn left, cross over the cattle grid and head forwards back down to the riverside. We turn right and continue to follow the footpath at the side of the River Otter, passing a footbridge on the left, until we come to the road bridge. We turn left over the bridge and Otterton Mill is on our right. The mill is a great place for a cup of tea and a sandwich sat on a bench by the river or if you wish give the mill’s cafe/restaurant or bakery a try. We then continue to walk into the village and turn left at the village green then left at the thatched house and continue forward at the end of the tarmac track uphill towards the trees. We keep heading forward with the river down below on our left until we come to a footbridge over the river. We cross the river turn right then retrace our steps back to Newton Poppleford. This is an easy walk on grass paths/tracks and very short distances of tarmac road following the River Otter. Approx 7 miles allow 2½ – 3 hours using OS Explorer Map 115, Exmouth and Sidmouth. This walk is a return walk with a small detour from Otterton. Start point: Otter Reach, Newton Poppleford. The River Otter, between the villages of Newton Poppleford and Otterton, in East Devon. From the M5 at Exeter take junction 30 then at the roundabout take the A3052 Sidford and Sidmouth road to Newton Poppleford. At the far side of Newton Poppleford Otter Reach is the last no-through road on the right. Parking: road side parking on Otter Reach in Newton Poppleford or there is a car park at Otterton Mill if you wish to do the walk from there. There are toilets at Otterton Mill and in the village hall with disabled toilets at Otterton. For refreshments in Otterton there is a cafe/restaurant and shop/bakery at Otterton Mill, the kings Arms and a community shop in the village hall. In Newton Poppleford there is the Cannon Inn which is also a B&B and the Southern Cross Tea Rooms. In Colaton Raleigh there is the Otter Inn and Woods Village Stores.